Two men injured in the 2014 KOMO helicopter crash obtained a $40 million settlement yesterday. The settlement was reached during a trial spread over the course of five weeks. Plaintiff Guillermo Sanchez and his wife were represented by aviation attorney Alisa Brodkowitz of Friedman | Rubin and Plaintiff Richard Newman was represented by David Beninger of Luvera Law Firm. The two firms worked together to bring about this substantial recovery. Alisa Brodkowitz represents victims of helicopter and plane crashes both nationally and internationally. “Seattle’s skies are now safer. Anyone operating a helicopter in downtown Seattle should be warned, risk public safety and you will pay dearly,” said Ms. Brodkowitz. Plaintiffs presented a case that the helicopter operator provided KOMO with a pilot who lacked promised training and was asked to fly the wrong helicopter. The KOMO news helicopter crash fatally injured both the pilot and his passenger, a local photographer, after it crashed on takeoff from a helipad next to the space needle. A Seattle jury heard evidence that to save money on fuel, the pilots were required to land and take off from the helipad multiple times each day, over the congested city streets. The pilots were not permitted to refuel at Renton Airport, where the helicopter was hangered. This refueling practice continued despite safety concerns for the public down below. During the trial, hundreds of pages of new, long overdue emails, surfaced from the defendants. One of the documents, an email chain from the now deceased pilot, documented his new safety concern raised just six weeks before the fatal crash. A crane located near the 75-foot elevated helipad created complications. Pilots were told they must fly an approach and departure over Broad Street, the very street where the crash occurred. They were also advised to land only on the top three-quarters of the helipad, leaving less room from the edge of the pad in the event of an emergency. Both Sanchez and Newman, the plaintiffs, were on their way to work when the crash occurred. 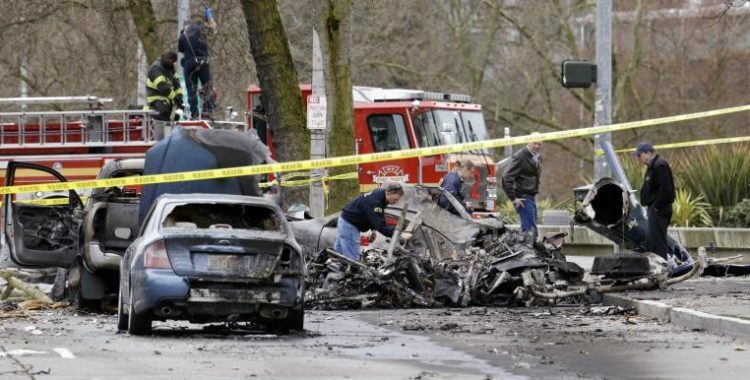 They were stopped at a red light on Broad Street near the space needle when the helicopter suddenly crashed on their vehicles and erupted in a series of explosions. Doctors testified regarding the injuries suffered by both, including blast injuries, traumatic brain injuries, burns and PTSD. Both continue to undergo treatment for their injuries.